Design Elements offers six collections of curtain and drapery hardware for your windows. These include the Renaissance Wood collection, Valencia indoor metal collection, the Metropolitan comtemporary collection and the Charleston indoor/outdoor metal collection. New to the line is the Metro Track system which is a hand drawn aluminum traverse rod. Also new to the Metropolitan Collection is an Acrylic curtain rod line. Renaissance includes 4, 6, 8 and 12 foot long curtain rod poles with a diameter of 2 1/4 inches. Fluted and twisted styles are available. Brackets, rings and finials are color matched. Charleston is made for the outdoors and offers a 1 1/2 inch diameter metal curtain rod up to eight feet long. A pole connector is available for wider windows. Valencia is available in a one inch diameter curtain rod pole up to eight feet long and also has a pole connector for wider windows. New to the line is the Charleston Indoor curtain Rods line available in many custom painted colors and teo stock colors. Color brouchures are listed below in pdf format. Product listing below is grouped by the collection. A modern sleek looking hand drawn traverse rod system for any window in your home. This contemporary style track can be mounted on the wall, from the ceiling or inside you window casing. It is a hand drawn system that uses ball bearing carriers to make opening and closing your curtain a snap. You can finish the ends off with a simple end cap, or select from several stylish finials made from wood, metal or acrylic materials. Strong aluminum construction to handle most fabric weights with ease. Comes in 4', 6', 8' and 12' lengths that can be cut to your exact size. Wider width windows can be covered by using special splice designed for the track. You can also choose to cut your rod for shipping by UPS if you need lengths longer than 105". BasicQ Inc. -- Premium Drapery Hardware 1 3/16"
Select Metal Premium Drapery Hardware 1 3/16"
The Select Metal Collection of 1 3/16" diameter Drapery Hardware enhances the Select Wood product offering. The Select Metal Collection is a premium collection of metal poles and accessories in five stunning finishes, Bronze, Brushed Brass, Graphite, Steel and Polished Nickel. Poles, finials and accessories are available in a choice of 3/4 inch and 1 3/16 inch diameters.This collection provides a variety of unique finial and bracket designs of superior quality with the convenience of in-stock drapery hardware. Rosettes and batons are available in matching finishes to complete your design. Select Metal poles can be cut to your exact size. If your window needs a rod over 104", you can have the rod cut or use two smaller size rods and connect them with the Select Metal Splice designed for the rods. Select Metal Premium Drapery Hardware 3/4" The Select Metal Collection of 3/4" Drapery Hardware enhances the Select Wood product offering. The Select Metal Collection is a premium collection of metal poles and accessories in five stunning finishes, Bronze, Brushed Brass, Graphite, Steel and Polished Nickel. Poles, finials and accessories are available in a choice of 3/4 inch and 1 3/16 inch diameters.This collection provides a variety of unique finial and bracket designs of superior quality with the convenience of in-stock drapery hardware. Rosettes and batons available in matching finishes. Select is available in three diameters, 1 3/8, 2 1/4 and 3 inch. 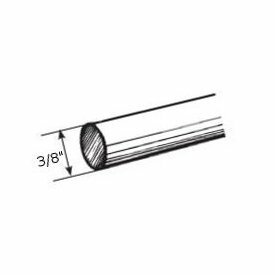 Lengths for these quality wood curtain rods vary from four feet to sixteen feet. Longer applications are available by using a connector screw and a center bracket support. This can also be use to join two smaller curtain poles in order to save on truck shipping. Any rods over 104" will have to be shipped by truck instead of FedEx and is more expensive. The Select Collection is available in eleven stunning finishes and the Select Limited is available in five designer finishes. Decorative wooden traverse rods are available using the Select wood attached to a heavy duty aluminum track system. Custom Expressions is another wood curtain rod system that can be finished with major paint companies color selectors. Kirsch Designer Metals Collection 19 new designer finials and 9 new finishes. Includes stationary and telescoping curtain poles with rings and traverse rods, smooth and fluted. Sizes from 38 inches to 180 inches for the telescoping, 8 feet on the stationary rods. Telescoping traverse rods are 1 3/8 inch diameter by 38 inches and up to 270 inches. Sets include brackets, finial plugs and tension device for cord. The number of slides for the traverse rods vary by the width. Extra slides and traverse rings are available as an option. Cafe curtain rods (right, brass finish) to 86" wide and spring tension shower curtain rods (left image) to 48" wide. Also, drapery pins and hook items are available for the final details of your instalation. These are sets that include hardware for mounting and instructions for hanging. Special purpose curtain rods by Kirsch for windows that require going around an arch top window, corners where two windows meet and bay windows that have angled corners in between are available with these basic curtain rods. Installion is easy for anyone by following the installation instructions included. Mounting hardware is included with each set and each rod is adjustable to fit your exact size. Kirsch Continental Curtain Rods come in two facial sizes, 2 1/2" and 4 1/2". These curtain rods can be used with wide pocket curtains or valances to achieve the look you desire. Available in white finish up to 150" long. Combinations, curved and bay window models and even a spring tension model for your exact needs. Pocket sizes need for the 4 1/2" is 5 1/2" and the 2 1/2" requires a 3" pocket. Kirsch sash curtain rods, (center image), are used on French Doors at the top and bottom of the glass to secure your curtain when opening and closing the door. If you are not sure how to put up a curtain rod, the instructions are included with the product. These are complete sets that include the hardware for installation. The width's are adjustable to fit any window within the size range listed. Spring tension curtain rods are used for mounting inside the window casement. Widths are adjustable to insure a tight fit without drilling into the window casement or wall. Round and oval profiles are available, see the two outside curtain rods in the image. Kirsch basic curtain rod sets with 1 1/4", 2", 3" and 4" clearance are adjustable in width and come with brackets for installation. Extension is available to add up to 24 inches to width. Optional brackets and supports can be purchased if needed. Kirsch superfine and empire traverse rods come in a varity of configurations to make it easy for you to get the right size and draw for your window. These basic traverse rods are designed to handle up to fifteen pounds with a one way draw and up to twenty-five pounds on a center draw. Pinch pleat draperies fit easily using standard drapery pins. Wall mount or ceiling mount installation can be achieved with the brackets included. Heavy guage rollformed steel is used for strength and the finish is baked on enamel, inside and out. End gates are provided to allow extra slides to be added or removed as needed. Select your size from the list below. Listed from shortest width to longest width, grouped by the type opening desired, center, one way right or one way left. Double traverse rod sets are also available ready to install.